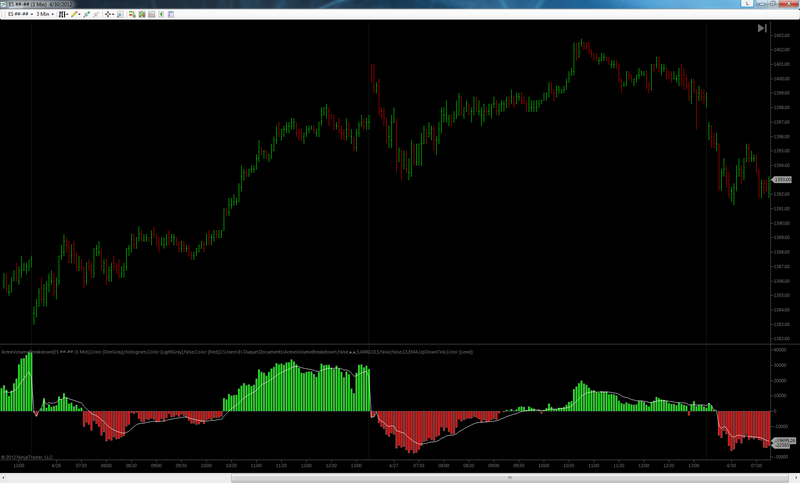 This one should be familiar to most volume profilers. It calculates buying vs. selling pressure for individual bars and accumulates that per-bar differential over an entire session, or longer. This is commonly referred to as a cumulative delta. Available in the Evaluation, Standard, Deluxe and Pro Editions. The breakdown (cumulative volume delta) can be calculated and displayed using both up/downtick and bid/ask evaluation strategies in the Deluxe and Pro Editions, up/downtick only in the Evaluation and Standard editions (see bottom of page for additional details). The breakdown can be displayed in 4 styles: traditional candles; OHLC bars; as a horizontal histogram; or as a colored line in the Deluxe and Pro Editions. The Standard and Evaluation Editions display only the candle style. Volume Breakdown data can be exported for detailed study in the analysis software of your choice, such as Microsoft Excel®, Google Spreadsheets and others (see images below). Pro Edition only. Fractals can be optionally plotted on the breakdown panel and the price panel to better monitor the conversation between price and volume. 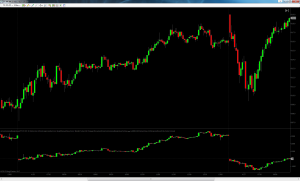 An optional moving average which can be plotted over the breakdown. Useful as a visual reference against an in-progress trend in buying or selling volume. Moving average calculation choices include EMA, HMA, SMA, TMA, TEMA and WMA. Choice of two modes. Continuous mode will not reset the breakdown accumulation to zero at the start of a new session, and when Continuous mode is off the breakdown will reset the delta to zero at the start of each session. Continuous mode can be useful for tracking the breakdown over longer expanses of time and across sessions. Configurable colors for up/down candle bodies and wicks. 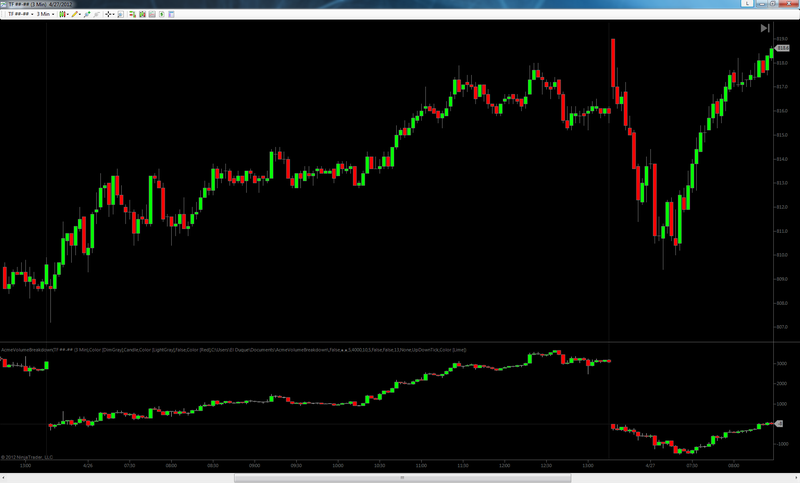 Supported on all NinjaTrader built-in bar types. 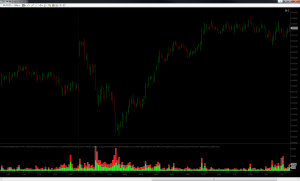 This one is conceptually similar to Acme Volume Breakdown, except that it does not accumulate volume deltas. 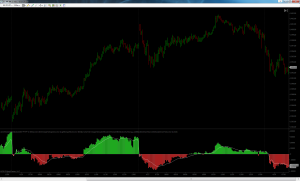 Its beauty is in its simplicity -it displays the imbalance in buying and selling pressure within a single bar. 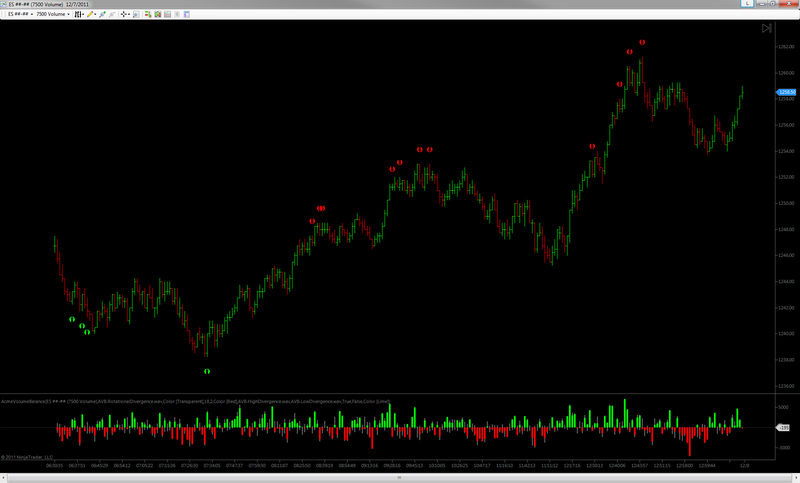 The Volume Balance is especially useful Volume Impression charts and charts used for monitoring short-term price swings. Available in the Deluxe and Pro Editions only. We think one of the best parts of the Volume Balance are it’s tails. 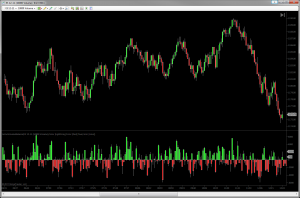 Tails show you the range the balance traveled above and below the zero line before arriving at its final value, and are extremely useful for showing you when buying pressure succumbed to selling pressure, or vice versa, within a single bar. So while the breakdown is great for watching price vs. volume agreement and disagreement, the Volume Balance is ideal for spotting reactions at key price levels and potential rotational reversals before they occur. Volume deltas can be calculated and displayed using both up/downtick and bid/ask evaluation strategies in the Deluxe and Pro Editions, up/downtick only in the Evaluation and Standard editions (see bottom of page for additional details). The Volume Balance data can be exported for detailed study in the analysis software of your choice, such as Microsoft Excel®, Google Spreadsheets and others. Pro Edition only. Choose between Delta, DeltaForce or Combined styles. 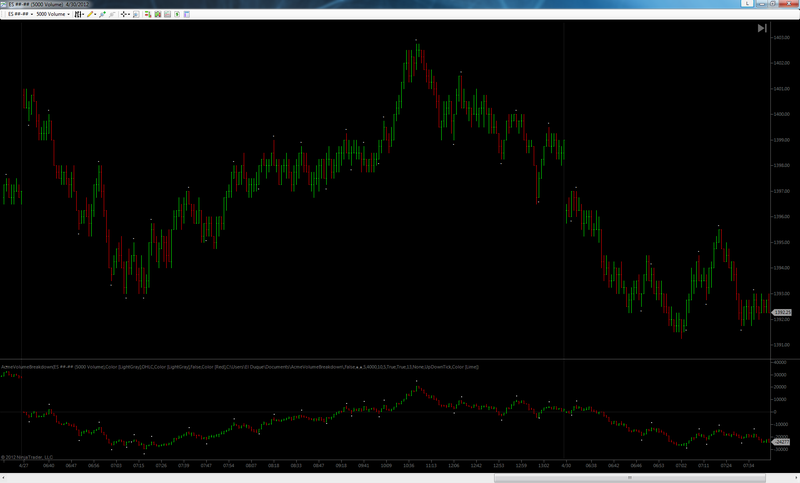 Delta displays only which side of the trade was dominant and by how much. 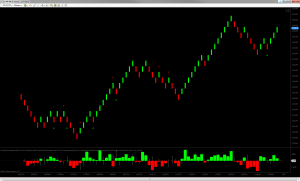 The DeltaForce style shows an adjusted delta (more info here) and the Combined style shows the total volume for a bar split by the relative strength of each side of the trade. Deluxe and Pro Editions only. 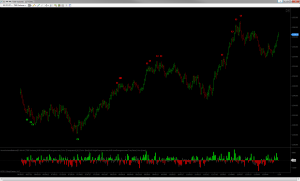 Visual and audio alerts on divergences that occur on new session highs or lows. On non-trending days, these are valuable reversal signals. The competition charges hundreds for just this one add-on feature! Alerts are given when price makes or is equals a new high but the balance closes negative. Conversely, another signal is given when price makes or equals a new low and the balance closed positive. Both of these conditions occur when price is being faded by the other, previously non-dominant side of the trade. Available in the Pro Edition only, see image below. 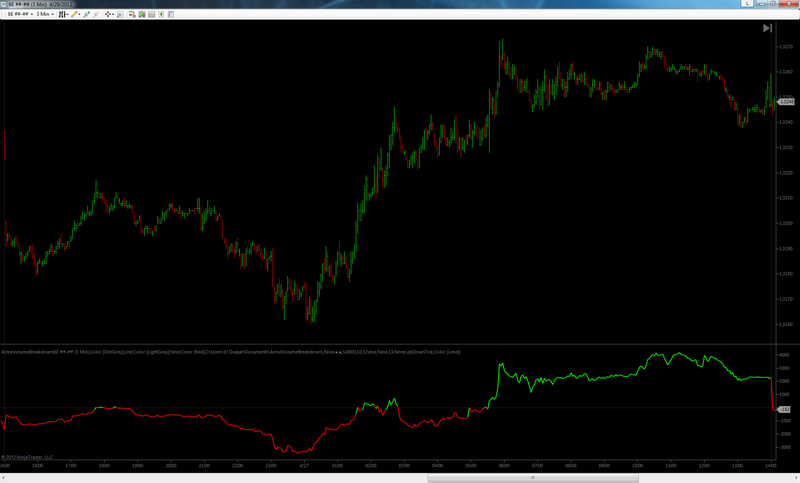 Visual and audio alerts for rotational divergences. Rotational divergences are less reliable than new high/low signals, but can be great at helping anticipate or confirm scalp trades in certain instruments and market conditions. 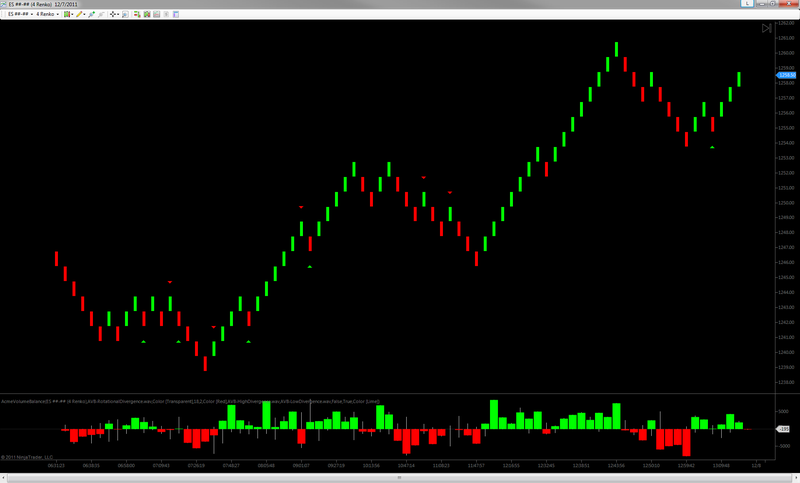 Works best on fixed-quantity bars such as volume, range, tick or Renko bars. The competition charges hundreds for just this one add-on feature in addition to the charge for the new high/low signals! Available in the Pro Edition only. Fully configurable colors for up/down candle bodies. NOTE: What is below is here essentially for historical purposes. Much has changed over the last few years with data feeds and so the phenomenon discussed below is not as present today as it was several years ago. 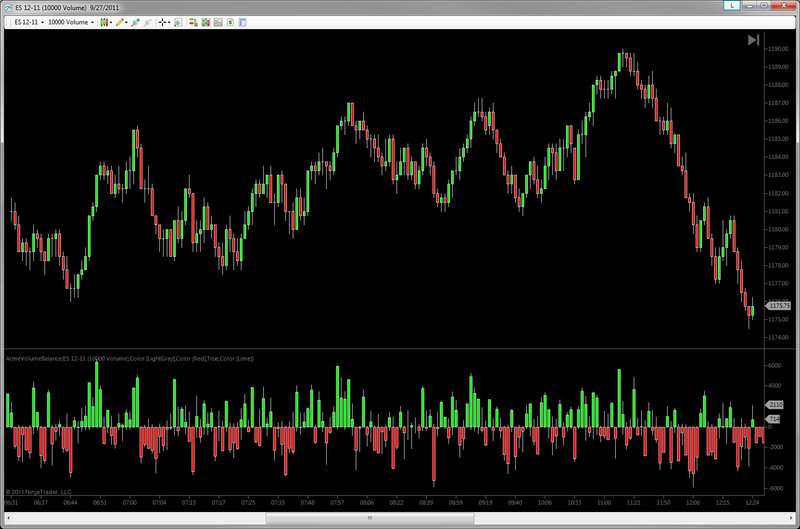 NinjaTrader 7 does not natively store bid and ask data in such a way that volume deltas can be created from historical data. So bid/ask deltas will only be displayed for periods where you are connected to your data feed and pulling live market data from your provider or during market replay. When bid/ask data is not available for an instrument, such as with spot forex, or when historical deltas are needed, up/downtick evaluation can be used instead. At times of heavy volume, bid/ask data can lag actual transaction data (more on this topic here). This lag can be a problem as these times are precisely when you want the clearest communication of the message that the volume balance or breakdown is trying to convey. By using up/downticks to calculate volume deltas, not tick or transaction deltas, these times of lag are simply no longer a concern. Volume in the futures markets is now overwhelmingly transacted in small lots and at high frequency, mostly by machines. Large transactions executed at the bid or ask are statistically rare and thus less useful than they were even a few years ago for assessing buy/sell aggression. 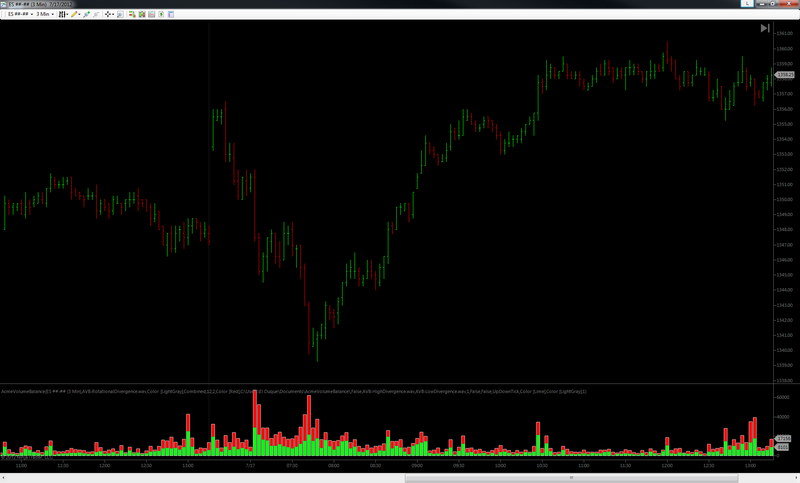 Up/downtick strategies evaluate all volume, not just volume at the bid or ask. Moreover, while the Acme bid/ask delta calculations include volume outside the bid/ask spread, many bid/ask-based delta calculation strategies ignore this so-called outside volume. We think this is ill-advised light of today’s market mechanics. Want to know even more? Check out this series of posts on price vs. volume. Finally, please don’t rely on any of the indicators in this pack if you rely on Interactive Brokers’ data feed. Their tick data is compressed, rolling several transactions into one tick with estimated volume. In our testing we’ve found their feed to be very fast, the data is simply not precise enough for calculating volume deltas.